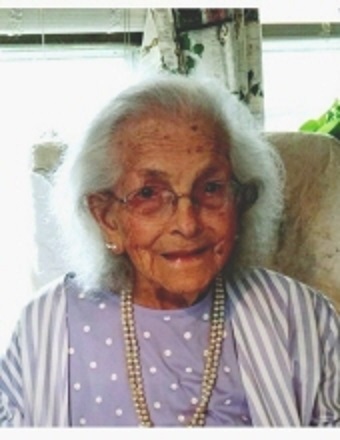 Kathryn Voyles, 99, of Hartsburg passed away on Thursday, September 6. 2018 at Abraham Lincoln Memorial Hospital, Lincoln. Kathryn was born on October 7, 1918, in Greenview, IL the daughter of Samuel T. and Lottie (Whiteman) Banister. She married Lewis M. Voyles on July 30, 1937, in Lincoln, IL. He preceded her in death on March 17, 1977. Kathryn is survived by her children, Ruby Swinford and Merle Abe Voyles; her sister, Vivian Skelton; 10 grandchildren, 25 great-grandchildren, and 20 great-great-grandchildren. Kathryn was preceded in death by her parents, husband, daughter, Vivian Harris; four sisters, and two brothers. Kathryn loved to cook and gather with her family. Services for Kathryn will be held at 10:00 a.m. on Monday, September 10, 2018, at Fricke-Calvert-Schrader Funeral Home, Lincoln. Visitation will take place from 2:00-5: 00 p.m. on Sunday, September 9, 2018, also at the funeral home. Burial will follow the services at Irish Grove Cemetery in Middletown, IL. Memorial donations may be made in Kathryn’s name to The American Heart Association.